Oh my god! (sorry for blaspheming but I just can't think of an appropriate face palm alternative right now). If science fact is often more interesting and exciting than science fiction then this book is not the poster child for fact verses fiction. Total buzz kill. This is more a science fact text book that explores what science knows about the universe and how life develops, or could conceivably develop, on other planets in a realistic and scientifically plausible manner. To be fair, this is what the book sets out to be. A book that can help you fill your science fiction stories with more believable science. That way, when you start going completely off the edge of known science, you'll have something to serve as potential grounding for your more outlandish ideas - to make them seem possible. However, if you're interested in real science, I feel you would likely already know the Astronomical Basics outlined in chapter 3 and quite possibly the Biochemical basics of chapter 4. For the lay person, like me, who is more interested in science fantasy (since the book makes a distinction between science fiction and science fantasy) technical discussions about planets, stars, and the universe along with the basics of what constitutes life is not a great place to hook me in. Boring as hell. These things are important but it's not until chapter 5 that this book starts to really discuss anything that looks like an alien. Which isn't great in a book that only has 11 chapters. More on that later. From chapter 5 onward it does start to get more interesting with discussions about how aliens might evolve and how their form and function would be molded by their environments. 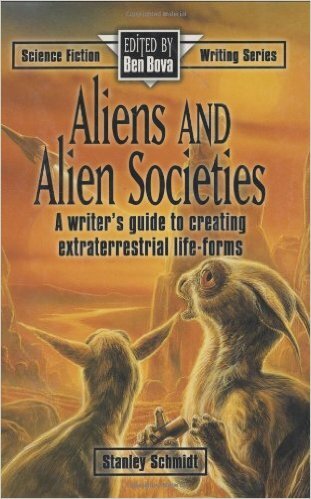 It then goes on to look at alien societies, language and how said aliens might interact with humans. 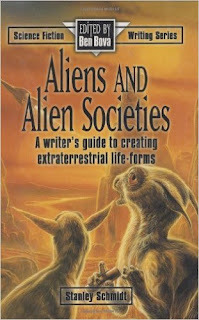 Also included is ideas for writing about aliens and their motivations along with case studies from various science fiction stories. All of the real science in the opening chapters really killed my enthusiasm for this book. Like I said, this stuff is obviously important but it's presented in such a large block of information, I just wanted to get past it and start reading about aliens. Then, when you finally do get to the point of talking about creating alien life the argument against aliens being anything remotely like humans is so strong it just sounds completely tedious to contemplate creating anything. It seems like every story featuring realistic aliens is going to have to include a 'first contact' scene. The book never seems to get beyond that point. Assuming there is alien life out there in the universe, it's conceivable there will come a time when humans have been interacting with it for years. Aliens from another planet will be as common place to us as people from other countries are now. There may even be a universal language. I guess I was hoping for more of that and less Close Encounters of the Third Kind. This book is certainly worth reading if you like your science fiction to be grounded in realism or you just want to know why science nerds keep calling you out for randomly picking stars with cool names for your alien worlds, without doing any research on whether life is even viable in those parts of the galaxy. I just feel it would have been a more exciting read if it had jumped right into case studies, talking about fictional aliens and reverse engineering their origins instead of leading with star charts and definitions of life.